24 Handmade kozo sheets embedded with dirt and sealed with beeswax; bound in an accordion structure; 11 1/2" x 9 3/8" x 2 "
This book examines the aggregation of taxing life experiences. Coalesce begins with compiling dirt and at various intervals finger marks appear in an attempt to remove this dirt, but ultimately ends with fully covered dirt pages. Collagraph and linoleum prints on handmade kozo paper. prints: 11" x 14"
This work is a two signature pamphlet stitch that features ephemeral prints. The prints in this work are achieved by embossing dirt into damp, coffee stained Stonehenge. The more the book is handled, the more it disappears, and by the end of the exhibition the pages will be blank. Multimedia installation featuring video, 8 light boxes, handmade kozo embedded with site specific dirt and sealed with beeswax, and dirt lines the floor. 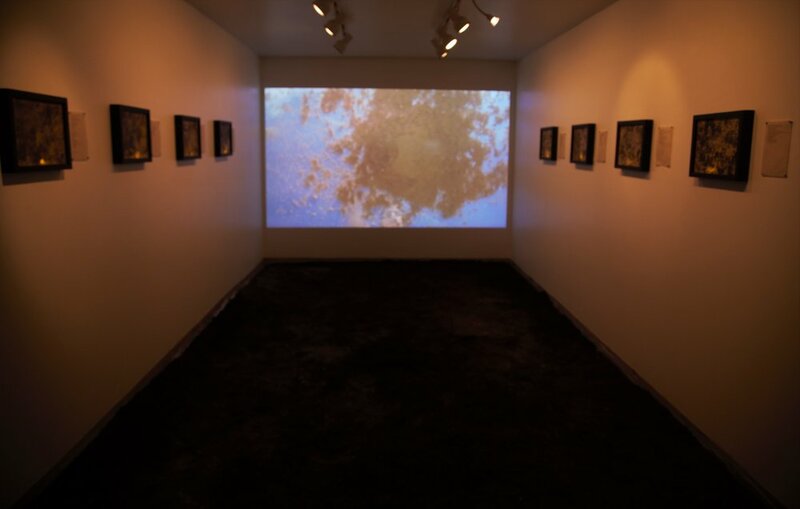 Projected on the back wall is a video in which dirt is periodically dropped onto plexi glass until it covers the frame. Then attempts to remove the dirt occur, but these attempts are ultimately futile as the video ends with the frame completely covered. As the video darkens from dirt covering the screen the lighting in the room changes as well. Additionally, viewers hear the sounds of falling dirt, footsteps, and shovels. Detail of the dirt that lines the floor. The dirt embedded in the light boxes has been gathered from specific locations that are of personal significance to me, and the addresses of these places have been embedded in the paper as well. Next to each box is a poem, whose title is the address of the location, and provides context for the significance of the location without being explicit aobut what it is. The light inside each box flickers like a candle, making each feel like a memorial for that memory or place.